Can be used also for hand and feet. Fine Grade Dead Sea Bath Salts body / Foot Scrub and Peeling , nourishes the skin and accelerates skin’s cells renewal. 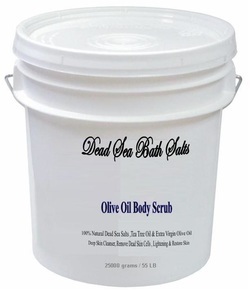 This unique combination of essential Dead Sea salt and minerals along with fine nourishing Extra Virgin Olive Oil produces the perfect nourishment for skin, leaving skin silky and enriched with minerals. The scrub cleanses the skin and help to remove the corneal layers. Removing the corneal layer allows the Epidermis layer to puff up and to diminish fine wrinkles , the corneal dead cells layer; prevent makeup’s from entering into your skin and radically reducing their efficacy. elimination of the dry layer will renew the appearance of healthy looking skin, while replenish its moisture, leaving skin looking smooth and fresh.